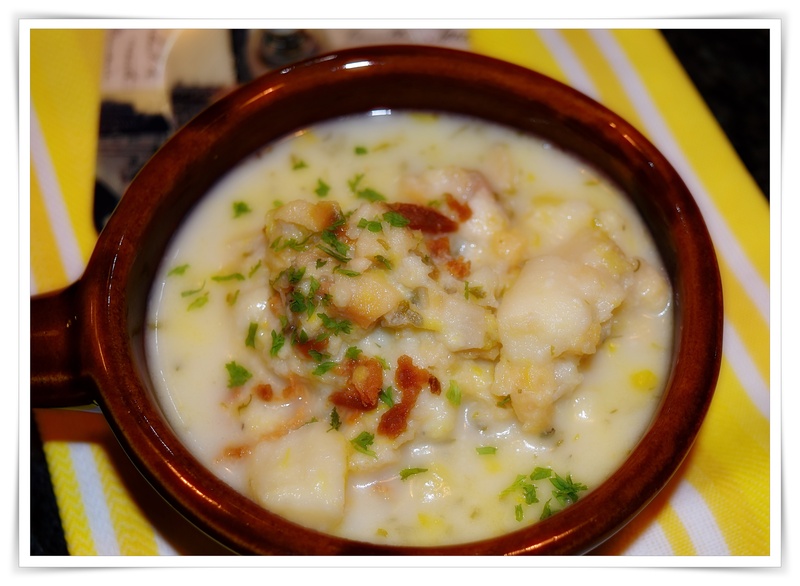 Nothing tastier than a hearty bowl of New England clam chowder on a blustery or dreary rainy day and to me it doesn’t need to be complicated, a few potatoes, celery, onions, clams and a little bacon. Then again I’m pretty good at changing things up a bit to suit my taste such as adding in leeks, thyme, bay leaves and switching out the russet potatoes for yellow or red potatoes. Now there is absolutely nothing wrong with using those lovely meaty canned clams, Sea Witch I think is the brand available in a huge 3.5 one pounds can (frozen clams are not in any of my stores, since we have access to fresh all year round) they come in a huge can. I have a lot of reserved clam and lobster stock in the freezer so I sweetened up the pot with a little lobster broth and was hoping for a few fresh clams, but with a lot of rain lately, none to be found that were fresh…oh yes, that lovely boule instead of a bowl goes a long way in our house so I will be filling one for Michael’s dinner tomorrow night, and yes the chowder is better the next day or the day after! I became familiar with Ellie Krieger and her recipes through Fine Cooking magazine and as a dedicated reader, subscriber and participant (Cook the Issue Challenge for a Year) I have made numerous Ellie Krieger recipes over the years. I tried to follow Ellie Krieger’s recipe this time and yes I suppose Canadian bacon is a bit healthier, but pretty tasteless in traditional clam chowder and I appreciate a little smokiness to my chowder. Note my changes below and Ellie’s easy original recipe follows. For a big triple batch I used an entire can of Sea Witch Chopped Clams strained broth plus 2 cups of light lobster stock, 3 ribs of celery including the inner light ribs leaves (the heart), 3 chopped leeks (white and light green parts, quartered and diced), 1/2 large Vidalia onion diced, 3 cloves of minced garlic, and 6-7 peeled red potatoes cubed. Seasonings included 3 small fresh bay leaves, fresh thyme leaves from 3 small sprigs or a little dried thyme, minced parsley, white pepper and a pinch of Phillips seafood season. Cream, bacon or pancetta white wine or vermouth are the last of the ingredients unless of course you have a few fresh clams for each bowl. The amount of pancetta or bacon may vary according to your taste, but I diced about 3 strips of thick sliced peppered bacon and left it in the pot, but if you want to remove it do so and reserve for garnish. Heat a large soup pot and add 2 tablespoons olive oil and 2 tablespoons butter sauté the bacon until crispy add the onions, leeks and celery for a few minutes until slightly softened add the minced garlic and the seasonings. Stir together and splash in about 1/4 cup dry white wine or vermouth, reduce slightly. Toss in all of the cubed potatoes, stir in enough broth to completely cover the potatoes and bring to a gentle boil cover and simmer for 10 or so minutes checking the broth level adding another cup or so, stir in cream and half and half, heat thoroughly cook (stir often) until the potatoes are tender. At this point you can choose to smash some of the potatoes, but I don’t. 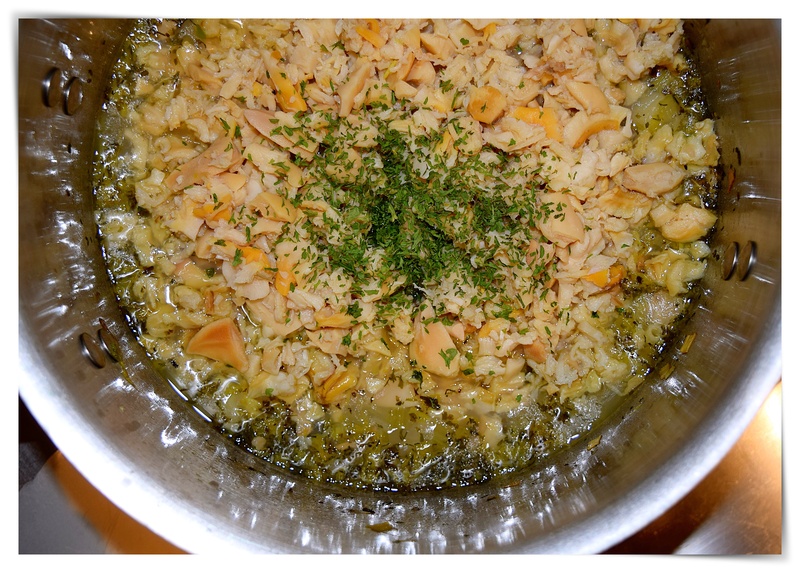 Toss in all of the reserved clams…thicken if necessary and simmer for several minutes. To thicken *Blend 2 tablespoons of very soft butter, 2 tablespoons of AP flour and the zest of one lemon (this will thicken the chowder). Serve with extra crispy bacon or pancetta, minced parsley and a few fresh steamed clams. Add the remaining 1 tablespoon oil, the onion, celery, 3/4 teaspoon salt and 1/2 teaspoon pepper to the pot and cook over medium heat, stirring occasionally, until the vegetables have softened, about 6 minutes. Add the garlic and thyme and cook, stirring, for 1 minute more. Add 1 1/2 cups water, the reserved clam juice (about 1 1/2 cups), the potatoes and bay leaf and bring to a boil. Partially cover the pot and simmer, stirring occasionally, until the potatoes are tender, about 15 minutes. Whisk the milk, cream and flour in a bowl until the flour is dissolved. Slowly add the mixture to the pot, stirring constantly. While stirring, bring the soup to a simmer (do not boil). Reduce the heat to medium low and cook, stirring occasionally, until thickened, about 8 minutes. Add the clams and simmer 2 minutes more. Discard the bay leaf. Add salt and pepper to taste.